September 2016 – South Kerry Development Partnership CLG. South Kerry Development Partnership Ltd. held its Annual General Meeting this week in Cahersiveen. 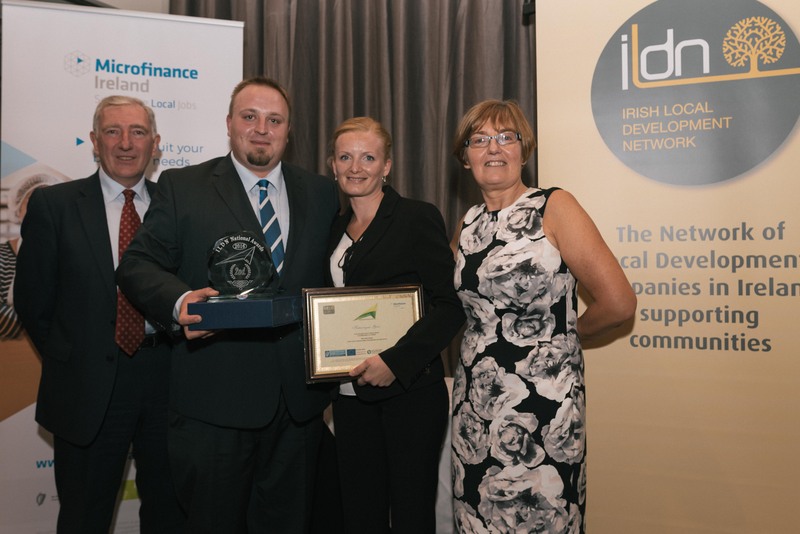 K&T Bakery & Restaurant based in Cahersiveen has taken second place overall in the newly established National Enterprise Awards organised by the ILDN. The national finalists had all come through as winners from the various regional finals and SKDP were represented at last night’s event by K&T Bakery & Restaurant Cahersiveen. Katarzyna Gwis and her husband Tomasz established the business in 2014 with support from SKDP enterprise officer Anne O’Riordan through the BTWEA. The business now employs 15 staff between full and part time and since its establishment the business has gone from strength to strength. The event was organised by ILDN to recognise the achievements of enterprises established by Local Development Companies through the Back to Work Area Enterprise Allowance Scheme (BTWEA) and Short Term Allowance Scheme (SEA). The awards night also sought to acknowledge the contribution of key partners in the process such as Dept. of Housing, Planning, Community & Local Government and the Dept. of Social Protection. Over 150 invited guests heard from a range of speakers on the night, including from both government Depts, CEO of Micro Finance Ireland and the Chairperson of the ILDN. Guests also viewed short video presentations from all 18 finalists. All finalists highlighted the importance of the support received from the BTWEA and the Local Development Companies in giving them the confidence and support to enable them take the initial steps in establishing their businesses. SKDP CEO Noel Spillane said that “on behalf of SKDP – I would like to congratulate Katarzyna & Tomasz of K&T Bakeries on their outstanding achievement in winning this award and it is due recognition of their hard work and commitment in establishing and growing their business. I would also like to acknowledge and thank our SICAP enterprise officers Joanne Griffin and Anne O’Riordan who, working in partnership with the local offices of DSP have supported hundreds of unemployed individuals to establish and development enterprises through the BTWEA & SEA. Noel added that without the support of Anne O’Riordan and the BTWEA – K&T Bakeries would not have been able to establish and grow their business and K&T bakeries are very grateful to the support they have received from both SKDP and the DSP. We wish K&T Bakeries continued success. First place went to Derek Walker from Letterkenny, Co. Donegal with his business Simply Natural Health. 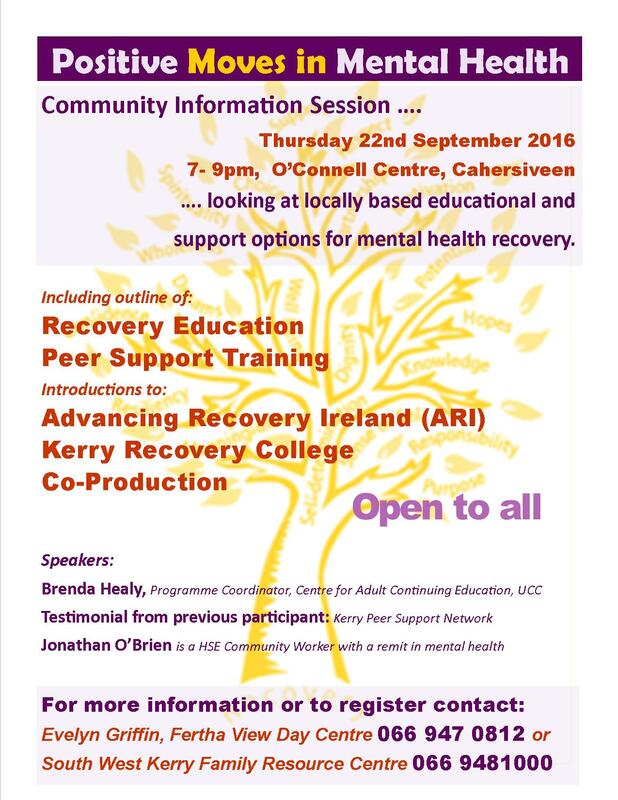 An information meeting on the topic of Positive Moves in Mental Health will take place this Thursday night (22nd September) in Cahersiveen. If you are interested in applying for LEADER funding, attached are some key Information Documents to advise and assist you in the process. Potential applicants are being advised that there are major changes to the process involved in accessing LEADER funding under the new programme that is due to start in Kerry in October. Both South Kerry Development Partnership Ltd. (SKDP) and North, East & West Kerry Development (NEWKD) will be holding a series of public meetings in the coming weeks to advise those interested in applying for funding of the new requirements. Circa €10m is available under the new LEADER programme in Kerry which represents a 60% drop when compared to the last programme. Eamonn O’Reilly, CEO of NEWKD pointed out that the LEADER programme will be rolled out on a consistent basis across the county to help minimise confusion for those interested in applying. “One of the major changes under this round of LEADER is that applicants will have to submit projects seeking funding during specific periods or calls which is completely different to the approach taken under the previous programme” Eamonn said. “The approval process under the new round of LEADER is also likely to be significantly longer due to the Government policy changes” he added. SKDP’s public meetings will be held on Tuesday 13th in Kenmare (Brook Lane Hotel), Wednesday 14th in Cahersiveen, (Community Centre) Tuesday 20th in Killarney (Travel Inn) and Wednesday 21st in Killorglin (Library Place). All meetings start at 8pm. 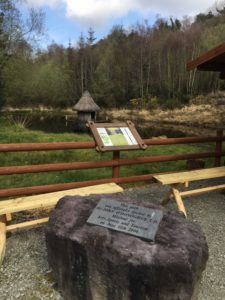 Beidh crinniu ar leith sa ceantair na Gaeltachta í gCiarraí Theas í mBaile na Sceilge ar an 4ú Deireadh Fómhair, aris ar a 8 a clog. NEWKD will hold their meetings in Dingle (Skellig Hotel) on Wednesday 21st, Listowel (Seanachaí Centre) on Monday 26th, Castleisland (River Island) on Tuesday 27th and Tralee (Áras an Phobail) on Monday, 3rd of October. Expressions of Interest from applicants will be sought for projects under the headings of Rural Tourism, Enterprise Development, Rural Towns and Basic Services when the programme opens in the county on the 3rd of October. Full details of the LEADER Programme and its operation will be given to potential applicants and both Development Companies are encouraging people to attend. A LIMITED NUMBER OF Scholarships are now available under The Kingdom Education Trust Fund for students who are engaged in accredited further/third level education courses & who may not be in a position to continue their education because of financial difficulties. There is also an online survey which people can complete if they are unable to make the public meetings.